Will Libraries Remove Computers When Mobile Arrives? I’ve been following discussions in two different worlds this week. The first of these is based on an article by Brian Mathews, in which he discusses the effect of mobile cloud computing on libraries. His ideas especially drew attention when the Chronicle’s Wired Campus blog pulled ideas from Mathews’ speculations in an article with the provocative title If Libraries Remove Computers, Will Anyone Come? This was such a good title 😉 that the LISNews blog also ran a follow-up article with the same title. My thoughts on the discussion are well-summarized in the title of my comments on the LISNews article – Removing Computers is Moot: Mobile, Cloud & iPad are Coming! My point (and I think Mathews’ point) is that mobile cloud computing is coming, and when it does, there will be little need to have computers in libraries because students won’t be using them. 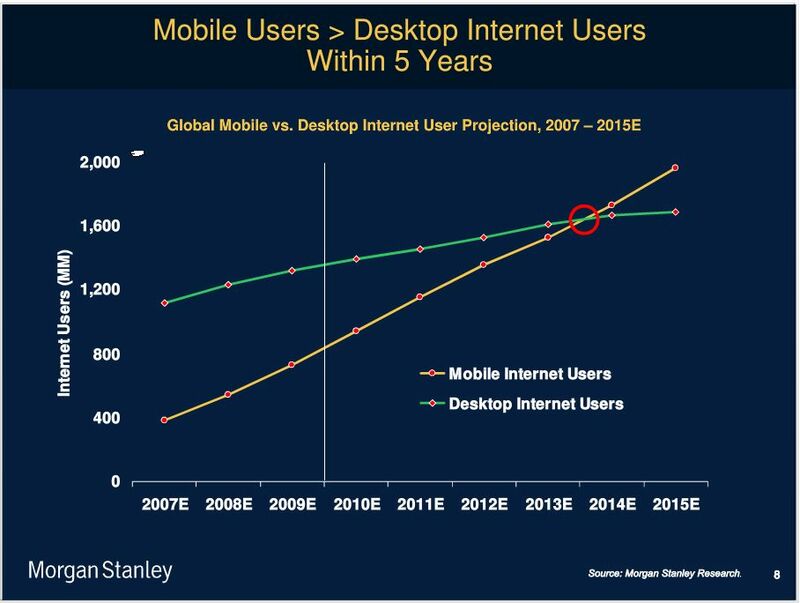 The other discussion I’ve been following is based on a talk given by Mary Meeker of Morgan Stanley (AKA “Queen of the Internet”) — Mobile Internet Will Soon Overtake Fixed Internet. Her talk was much–discussed and her slide below was much shared on blogs — It’s relevance to the Libraries Removing Computers discussion is apparent — Mobile is going to overtake Desktop by 2014. What will libraries be like by then? Posted in Libraries, Mobile, Mobile Libraries, PicsYes, Uncategorized. 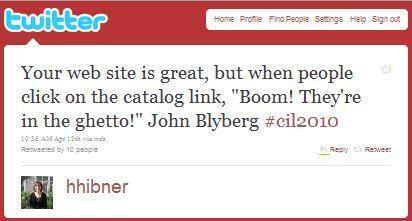 Holly Hibner’s tweet about John Blyberg‘s talk at the recent Computers in Libraries (#CIL2010) was one of the mostly highly retweeted posts of the conference. Blyberg’s metaphor captures the thought that I’ve had swimming around in my head for long — What’s the use of making an elegant, user-friendly library web site when the centerpiece of the whole library info-ecosystem — the catalog — is hopelessly difficult to navigate? I blogged about this in October when I found a great graphic (part of which is below left) that points to the striking contrast between the simple, inviting user interfaces of dotcoms like Google and Apple, and the much more complicated interfaces of libraries. 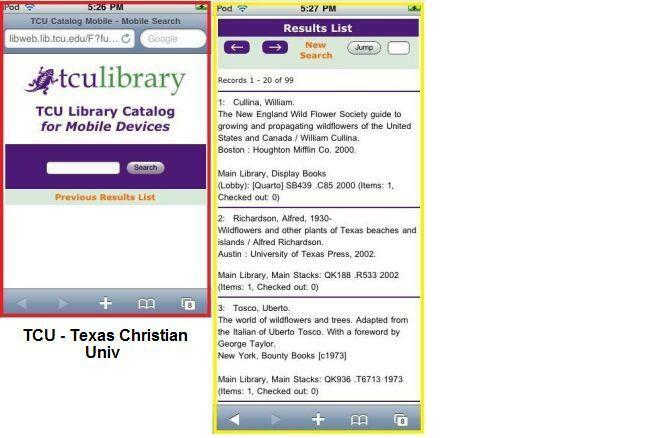 With the small screen of mobile devices the trimmed-down, mobilized library website makes the old, non-mobilized library catalog seem even more ghetto-like, using Blyberg’s phrase, so that it’s questionable to even link to the catalog from the mobile library site. With the constraints of mobile design, we have no choice but to take up the opportunity and simplify. 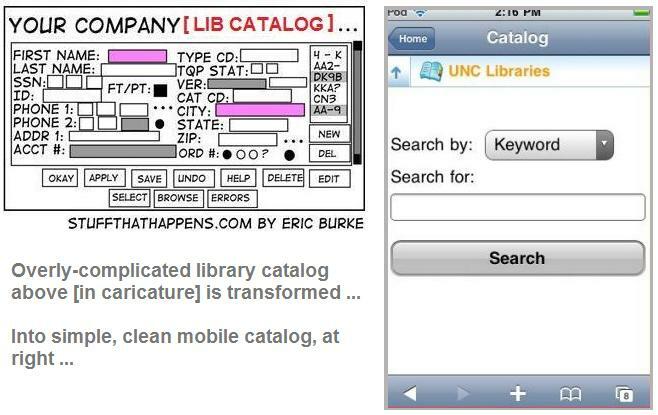 Several libraries have now mobilized their catalogs, among them the clean, simple design from UNC below. Scroll down for links to a series of articles I’ve written on mobile design and libraries. Flickr set has graphic above & the full version in other article, that shows the context of the library catalog caricature. 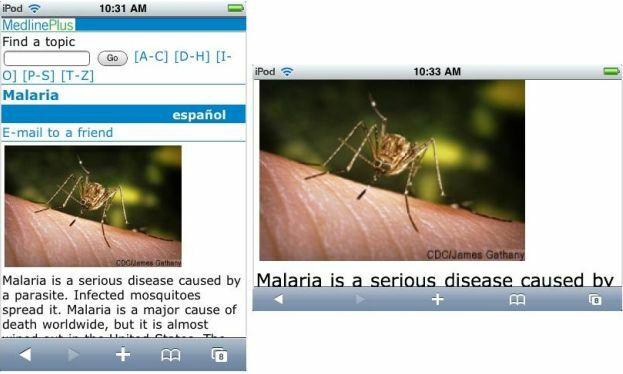 Posted in Libraries, Library Catalog, Mobile, Mobile Design, Mobile Libraries, PicsYes, Uncategorized. The screenshots for each catalog are color coded — Red is the beginning search screen, yellow is the list of retrievals, and green is the complete record. The Flickr set has separate, larger screenshots for each screen, and the color is maintained in those to make it easier to pick out different screen types. Iowa City Publ Lib [Flickr] is one of four AIRPAC mobile catalogs from Innovative Interfaces (Boulder, ICPL, Orange Co, & Stark Co tagged together in Flickr set), all of which have similar look & feel. 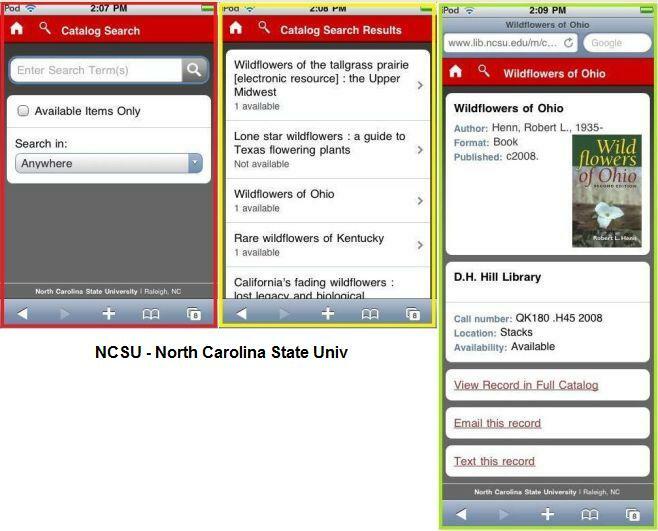 NCSU [Flickr] is one of the first mobile catalogs, and still an excellent design. Texas Christian (TCU) [Flickr] is notable because it has only a list of brief records for retrievals, with no links to a more complete record for each one. Tri-College [Flickr] is interesting because it has a brief “drop down” complete record, that opens while keeping the context of the list of other retrieved items. I chose Univ Virginia [Flickr] because I like its pleasing, simple design. If you know of other mobile catalogs, send them in, via comment or email. 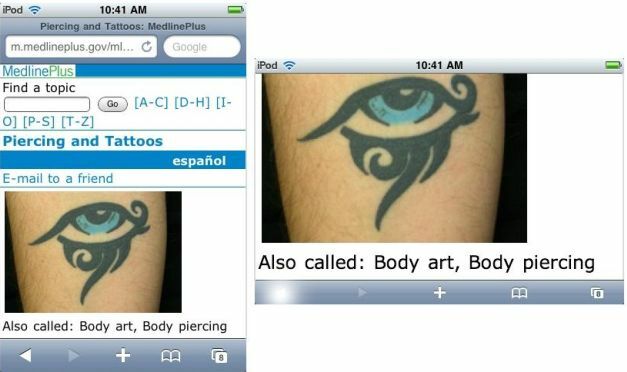 Posted in Flickr, iPhone/iPod Touch, Library Catalog, Mobile, Mobile Design, Mobile Libraries, PicsYes, Uncategorized. 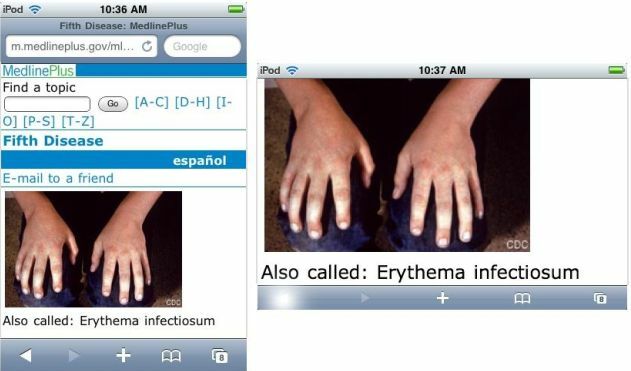 Mobile Library Interface – Reduce Options, Simplify! 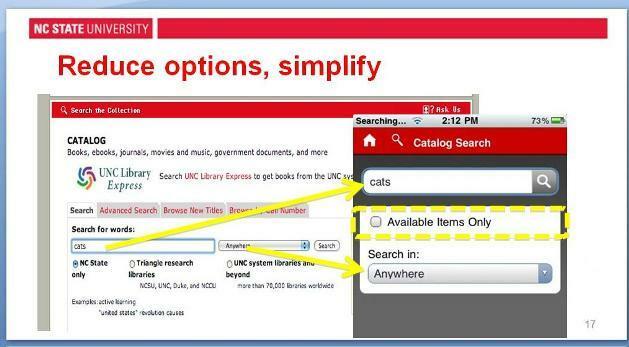 The slide below (from a recent webinar on the NCSU mobile library site) does a great job of conveying what I’ve been saying recently about the importance of keeping mobile sites simple. It also brings to mind the bottom sketch from a recent post. Taken together, these two graphics give me hope that, with the advent of mobile tech, libraries are catching on to simple design. Traditionally, the design of library interfaces (especially OPACs) has tended to take the “everything but the kitchen sink” approach, with way more information than users attend to (as shown in the bottom sketch). With the restrictions of small screen mobile-devices, though, I suspect the appeal of simple design will become more apparent, as shown nicely in the NCSU mobile catalog search. Posted in Elegance, Library Catalog, Mobile, Mobile Design, Mobile Libraries, PicsYes, Uncategorized. Posted in Elegance, Libraries, MedlinePlus, Mobile, Mobile Design, Mobile Libraries, PicsYes, Uncategorized. The most effective way to reach ALL of your mobile users is to create a mobile friendly website. If your website is mobile friendly then you don’t have to worry how many of your users have iPhones, Blackberrys, Androids, Pixis, or whatever the next trendy sparkly new device, THEY ALL CAN USE YOUR CONTENT if your website is mobile friendly. Creating a mobile friendly website is the biggest bang for your buck [boldface by me]. It doesn’t require as much programming knowledge as an app and you are able to target way more people more effectively rather than constantly creating different apps. I think Michelle is right on target — The world is going mobile, and we need to learn how to serve it. As I say in the OITPL article, we should see this as a great opportunity to help the world to discover the best way to design information on a small device, and in the process, win over the next generation of potential library users. (Note that, although I suggest in the previous article that libraries consider providing each staff member with an iPod Touch, I’m open to considering other devices if/when they become as practical as the iTouch — The underlying point is that we need to get mobile devices. Posted in iPhone/iPod Touch, Libraries, Mobile, Mobile Design, Mobile Libraries, PicsNo, Uncategorized. Just as studies were beginning to show that readers will not read extended pieces of text on computer screens and would use these e-book collections simply for searching, not reading, the Kindle and the iPhone arrived. These devices have shown that dedicated e-readers and smart phones are e-book platforms par excellence; they make e-books work. But unfortunately for academic libraries they don’t work with the huge e-book collections they’ve amassed in HTML and PDF (at least not very well). The result being that as the ownership of e-readers and mobiles begins to increase across campuses, the library’s e-book collection is in danger of becoming a very expensive white elephant, underused at best and perhaps already obsolete. Dan’s article especially caught my attention because two days ago in my article One iPod Touch per Librarian (OITPL), I suggest that libraries would do well to become more involved in the exploding world of reading on mobile devices. I see Dan’s article as a good example of this — In order for us to put pressure on publishers to provide eBooks on mobile platforms, as Dan suggests, we need to be experienced in using those platforms. And the iPhone/iPod Touch is clearly the reader’s choice now. 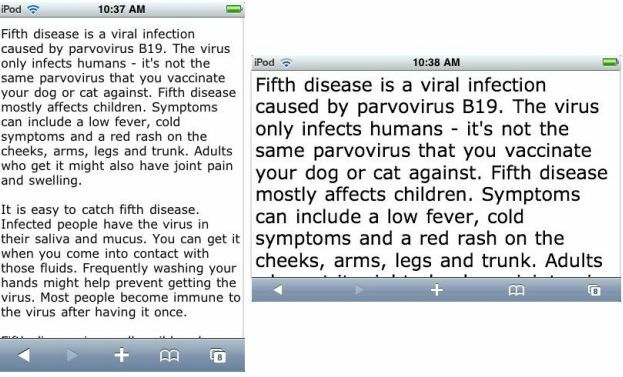 Posted in eBooks, iPhone/iPod Touch, Libraries, Mobile, Mobile Libraries, PicsNo, Uncategorized. Tim Spalding, on the other hand, says this: “Resolved: The Os were the ‘Lost Decade’ for library tech—libraries made incremental advances, while others flew past them.” Having gotten an iPod Touch (aka iTouch) myself recently, I get the strong sense that much of what Spalding is talking about is the explosion in mobile, especially iPhone/iTouch, use, especially by young people, in the last few years — which has made few inroads in the library world. So what about the next decade in libraries? How can we catch up to Spalding’s world that’s flying past us? My suggestion is that we get on the mobile wagon as quickly as we can. And the most practical way to do that right now is the iPod Touch (most of the capabilities of an iPhone without the phone and its high monthly AT&T costs). 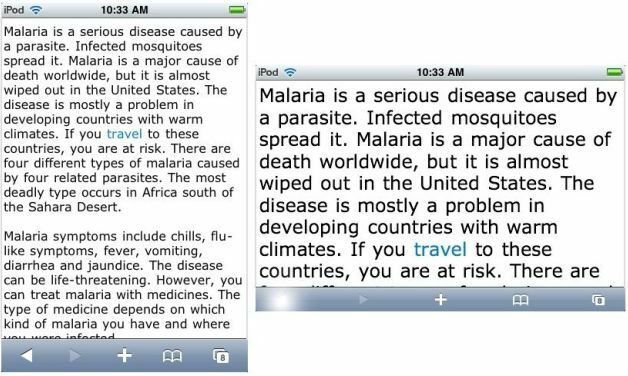 The premium in designing information for mobile displays is Simplicity — Dotcom sites are feeling very pinched because small mobile device screens don’t leave much room for ads and Bells&Whistles — Popular mobile news sites, for example, have mostly the text of news stories on their pages. Likewise, blogs that are well-optimized for mobile (WordPress Rocks!) have just the essential text and accompanying pictures. A simple, streamlined screen-environment fits us in libraries very well — We don’t have to worry about squeezing ads on our pages, and we’ve never tried to compete with dotcom Bells&Whistles. So mobile seems like a natural for us. So why haven’t more libraries adopted mobile tools? 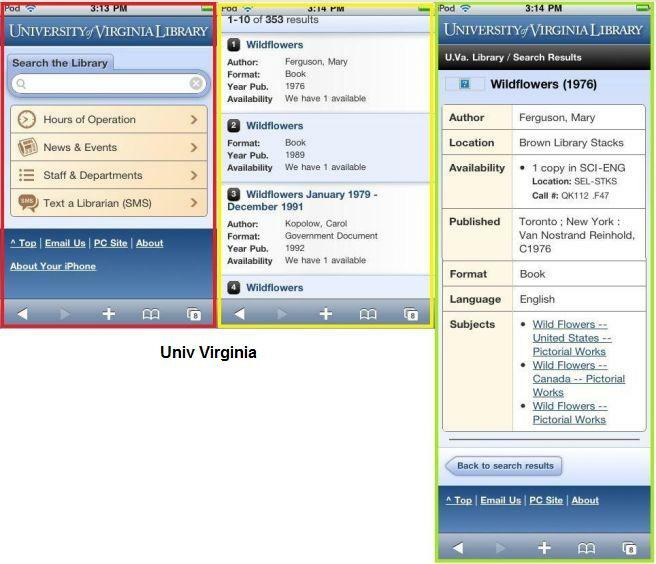 There certainly are libraries that have developed mobile interfaces for some of their services. 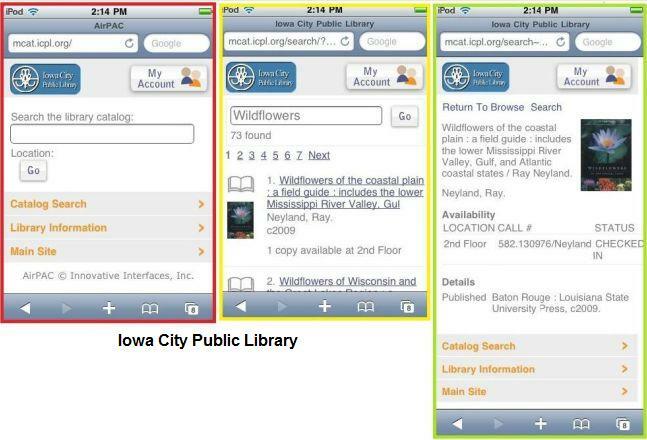 But a big barrier to more general of embracing of mobile in libraries is that the information that we have in the “library silo” — most notably the online catalog — is generally not in mobile format (**see below). I suspect that many users, when they see that our “mobile sites” don’t include the catalog, are going to lose interest quickly. The cost of an iTouch is in the $150-$200 range, making it practical for most libraries to consider providing each staff member with one. The real investment, I think, is going to be learning how to integrate library services with them. It’s going to take an adventurous, visionary administration to accomodate staff time to “play around on the new toy” to learn how to use it. In many ways, I’m finding the mobile interface on the iTouch to be “uncharted waters.” The standards for what makes a good mobile site are yet-to-be-written — Bloggers, journalists, publishers, web developers — are all hard at work looking for the best approach, competing for the users’ attention. Whoever gets it first will be the winner in the next decade — Hopefully libraries will do better than in the last one. 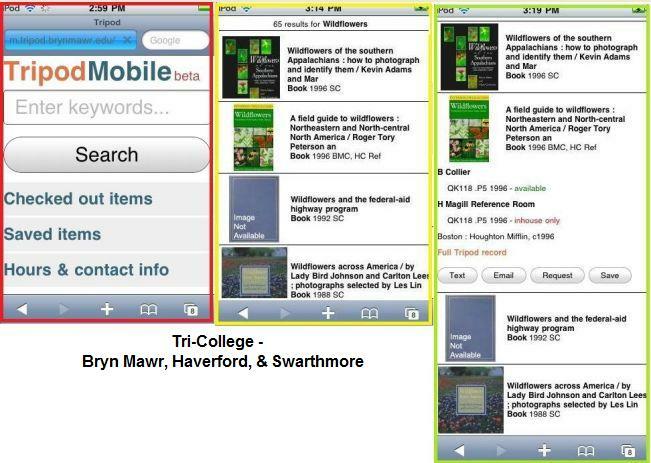 **Library Catalogs in mobile format – The only ones I’ve been able to find that have what I would call a truly optimized interface, to make them readable on an iTouch, are North Carolina State Univ, Iowa City Public Library, and Univ North Carolina — Please tell me if you know of others! Posted in Elegance, iPhone/iPod Touch, Libraries, Library Catalog, Mobile, Mobile Design, Mobile Libraries, PicsNo, Uncategorized. If you know of others, please send email or post comment. Posted in iPhone Optimized, iPhone/iPod Touch, Libraries, Mobile Libraries, PicsNo, Uncategorized.